Diabetes can affect your eyes and is one of the leading causes of blindness in the adult population. People with either type I (insulin dependent) or type II diabetes (non-insulin dependent) are at risk. 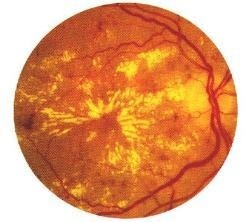 This is a normal retinal image to help you see the changes due to diabetes in the eye. The orange background is the retinal tissue. The red lines are the arteries and veins that nourish the retina. The dark orange blur in the center is the macula, site of your best vision. The yellow disc or donut to the right side is the optic nerve. In general, complications of diabetes affecting the eyes are due to problems with the very small blood vessels of the retina called capillaries. Typically, the capillaries become weak and small out-pouchings occur known as microaneurysms. These microaneurysms can be leaky, allowing serum (blood without any cells) to saturate the retinal tissue causing edema (wetness) preventing the retina from functioning properly. 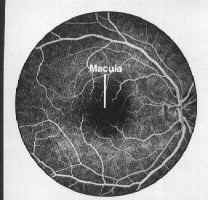 If the edema occurs in the macula, a part of the retina responsible for fine reading vision, vision is blurred. Sometimes the microaneurysms can rupture causing small or large hemorrhages in the retina or bleeding into the vitreous, causing blurred vision. Capillaries can become occluded, resulting in small areas of the retina to become starved of oxygen and nutrition (hypoxia) resulting in blurred vision. 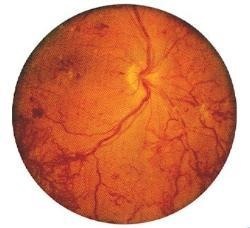 If enough retina is starved of oxygen, new blood vessels can start to grow throughout the retina and into the vitreous. These new blood vessels are weak and easily rupture resulting in hemorrhages and scar tissue formation, which can contract and pull off the retina from the back of the eye resulting in blindness. Preventing complications of diabetes from causing vision loss begins with a complete eye exam by Dr. Gualtieri. During an exam, he will dilate your pupils to see into your eye and evaluated the retina for changes related to diabetes. If leaking micraneurysms are found which may cause vision loss, Dr, Gualtieri will perform a special test, called a fluoresceine angiogram to better define the blood vessels and circulation. Abnormal blood vessels will show up as tiny white bulges from microaneurysms or fluffy white clouds from new blood vessel growth. 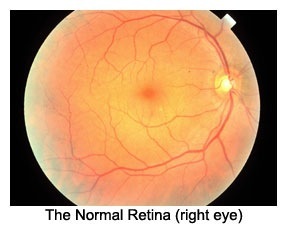 This is an image of the normal retina. The dye appears white as it passes through the normal blood vessles. The weak blood vessles form small pockets or bumps called microaneurysms. These appear as small white dots on the black background. Blood serum leaks out of the microaneurysms. The retinal tissue around the leaking blood vessles becomes edematous (soggy) and does not function well. 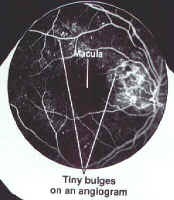 If the zone of edema is large and involves the macula, vision will decline. Advanced diabetic change inside the eye is demostrated by massive leaking from newly formed but abnormal blood vessle fronds. The large white cloudy spots represents the dye leaking from leaking, weak, and ruptured vessles. With this information, Dr. Gualtieri can use an argon laser beam in the office to seal leaking capillaries, allowing edematous (wet) retina to dry up and restore vision. 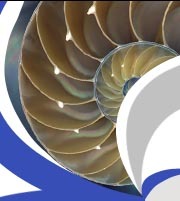 A special lens is placed on the eye to view the retina and localize the leaks. A pin point precision laser beam burst is placed on the leaking vessle to seal it closed. This is called FOCAL treatment. If the edema is a bit larger, a GRID pattern is used. 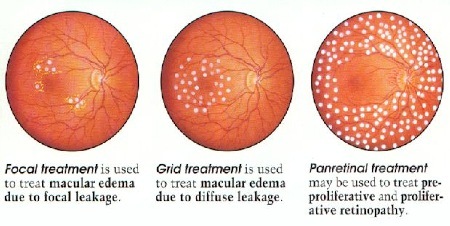 If there is new blood vessle growth and severe bleeding, PAN-RETINAL treatment is needed. Patients with diabetes should be examined at least once a year to monitor for diabetic eye diseases. If diabetic disease is present in the eye more frequent visits are necessary. If you have diabetes, DO NOT DELAY, call our office at 619-688-2648 immediately for an exam, it may just save your sight!